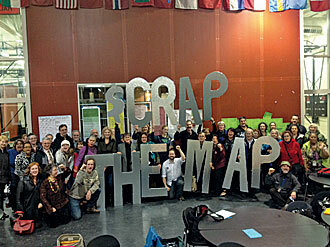 “Voices of a People’s History,” 10th anniversary edition features testing resistance & MAP Boycott! 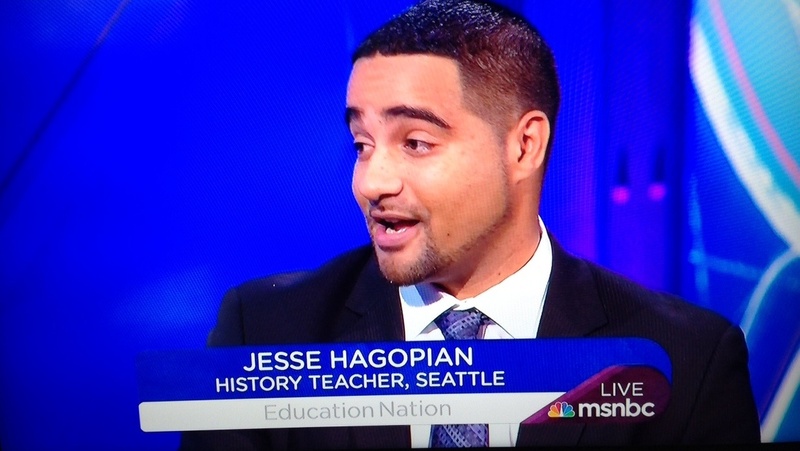 Howard Zinn and Anthony Arnove’s updated primary source companion to A People’s History of the United States includes Amber Kudla’s anti-standardized testing graduation speech and Jesse Hagopian’s reflection on the Seattle MAP test boycott. Since its publication in 2004, Voices of a People’s History of the United States has played a vital role in my classroom—not only revealing the voices of social justice from the past so often choked into lifelessness by the standard issue corporate textbooks, but also inspiring my students to take actions of their own. Over the semesters and over the years, I repeatedly point students towards this collection of primary sources when they want to understand the ideas that helped propel social change: Bartolome De Las Casas’ “The Devastation of the Indies;” Tecumseh’s “Speech to the Osages;” Fredrick Douglass’ “What to the slave is the forth of July;” Sojourner Truth’s “Ain’t I a Woman? ;” Eugene Deb’s statement to the court upon being arrested for speaking out against WWI; Helen Keller’s “Strike Against War;” Billie Holliday’s “Strange Fruit;” Bob Dylan’s “Masters of War;” Malcolm X’s “Message to the Grassroots,” and many others. One of the many great actions that students at my school participated in was the 2013 boycott of the Measures of Academic Progress (MAP) test. When teachers announced that year they would refuse to give the deeply flawed MAP test, the student government voted unanimously to support that boycott. When teachers wouldn’t give the test, the school district decreed that the building administration would have to pull students out of class and march them off to the computer labs to take the test. It was then that students staged a sit-in—in their own classrooms!—refusing to have their class time wasted by a test that was not relevant to what they were learning in class. I am at a loss for words to describe what it means to me that the newly updated, 10th anniversary edition of Voices of a People’s History of the United States, includes my essay reflecting on the meaning of the MAP test boycott and how it has contributed to an uprising for education justice around the country. It is also beyond words that Voices includes a speech by Amber Kulda, a young women I came in contact with through the editing of my book, More Than a Score: The New Uprising Against High-Stakes Testing. Amber was the valedictorian of her class and was asked to give the graduation speech. She tried to get out of it, but the principal wouldn’t let her. So she used the occasion to deliver and uproariously funny and deeply moving address about why she wasn’t the smartest person in the class just because she had high grades and test scores—and why our society needs to think outside the bubble test. Those in the movement to defend our schools from the corporate education reformers should read these essays on education justice in this new addition of Voices; but if you want our movement to win—to truly defeat the testocracy once and for all—you should read all the entries in the book to develop a political analysis of how war, racism, sexism, homophobia, capitalism, and other interlocking systems of oppression degrade our world and our education system. Then you raise your own voice! 10th anniversary edition of Voices of a People’s History also includes many of my modern day heroes, including contributions from war resister Chelsea Manning, climate and economic justice advocate and author Naomi Klein, the immigrant rights activists Dream Defenders, and the unparalleled journalist Glenn Greenwald. 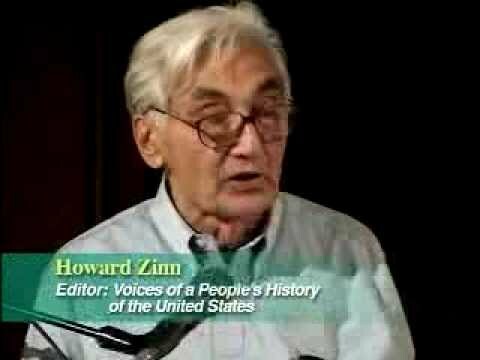 Paralleling the twenty-four chapters of Zinn’s A People’s History of the United States, Voices of a People’s History is the companion volume to the national bestseller. 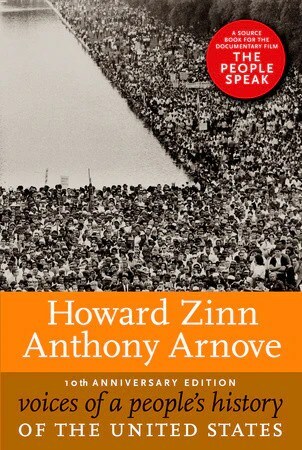 For Voices, Zinn and Arnove have selected testimonies to living history — speeches, letters, poems, songs — left by the people who make history happen but who usually are left out of history books. Zinn has written short introductions to the texts, which range in length from letters or poems of less than a page to entire speeches and essays that run several pages. Voices of a People’s History is a symphony of our nation’s original voices, rich in ideas and actions, the embodiment of the power of civil disobedience and dissent wherein lies our nation’s true spirit of defiance and resilience. The 10th anniversary edition will feature new voices including whistleblower Chelsea Manning; Naomi Klein, speaking from the Occupy Wall Street encampment in Liberty Square; a member of Dream Defenders, a youth organization that confronts systemic racial inequality; members of the undocumented youth movement, who occupied, marched, and demonstrated in support of the DREAM Act; a member of the day laborers movement; and several critics of the Obama administration, including Glenn Greenwald, on governmental secrecy. Black Student Union: “This is our time to speak”–Are the education reformers listening? Do you want unlimited articles for your website ?